As a native Oregonian, I’m intimately familiar with the organic, free-range, local, raise-your-own chickens, slaughter-your-own-meat food movement sweeping Portland. There’s an obsession with raising and killing animals humanely — or not eating them at all. But what if an animal slaughter wasn’t a sobering occasion, but rather a public celebration? This is the reality for Muslims in Indonesia, who can pinpoint their last animal slaughter to Idul Adha, an Islamic day of sacrifice that resembles a party more than a mechanical ritual. Idul Adha (or Eid al-Adha) is a holy day that occurs in the midst of the Hajj pilgrimage season. It honors the prophet Ibrahim’s near-sacrifice of his son, Ishmael. God stopped Ibrahim at the last moment, recognizing his extraordinary faith and permitting him to sacrifice a goat instead of his son. Idul Adha celebrations in Indonesia and many other Muslim-majority countries are, thus, a time of thankfulness and renewed commitment to God, centered on the bloody sacrifice of an animal. It became clear my East Java city of Madiun was preparing for Idul Adha when goats suddenly appeared on every street corner and in every empty lot. Advertisements for cows emblazoned with the word “Qurban” (sacrifice) were plastered to the trees lining my street, and students began asking me if I was coming to the “slaughter” on Saturday. Small, familial goat sacrifices took place on Friday, but I was warily looking forward to the school’s ceremony the following morning. I arrived at my school at 6 a.m., dressed in my batik-best for the wedding parties I would be attending later in the day. The slaughter was already underway and I quickly realized how vastly overdressed I was for the gory event – my fellow teachers and students were dressed in t-shirts rolled to the elbows and armed with machetes. I crossed the school field to the slaughter area and my teaching counterpart ran to greet me, maneuvering between a cow head and a carcass where the Idul Adha butchering specialists were hard at work dissecting the massive body. My counterpart led me to the “observation area,” where teachers were lined up in chairs chatting and sipping cups of coffee from the school canteen. As I talked with the teachers in my still-developing bahasa Indonesia, I learned that it is common to sacrifice both goats and cows for Idul Adha in Indonesia. Students at my school had pooled their money to purchase two goats and the teachers had purchased three cows. One-third of the meat goes to those who purchased it, another third goes to their relatives and friends, and the final third is distributed to the poor. I looked on as six men logically segmented the cow body, roughly hacking at the difficult bones and carefully handling the more delicate parts. Male students rushed back and forth with sloppy buckets to take each part to the back room to be divided and sorted. I felt slightly mual (queasy), though I tried my best to hide it. Fortunately, there was little smell and the remaining carcass hardly resembled the animal it once was. As a Christian at a Muslim ceremony, I intended to be a passive observer. But the teachers had other plans in store for me as they shoved me into the prepared classroom: “Ayo, Miss Kelsey, cut beef!” I rolled up my sleeves and slacks and noticed three long mats running the length of the classroom floor. People sat cross-legged around each. The mat farthest to the right was the “skilled carving station,” where some male students and teachers deftly cut the meat from difficult areas like the leg bones or the ribs. Female students and the junior female teachers gathered around the middle mat, the “hacking station,” and worked in pairs to separate the meat from the fat and cut the larger sections of meat into manageable pieces. The senior female teachers were seated at the left mat, the “weighing station,” surrounded by scales and sorting single kilos of meat into individual bags. Some of the larger bags were labeled with names of the teachers and classes to bring home to cook, while white bags stamped “SMAN 6 MADIUN” would be distributed to the poor. 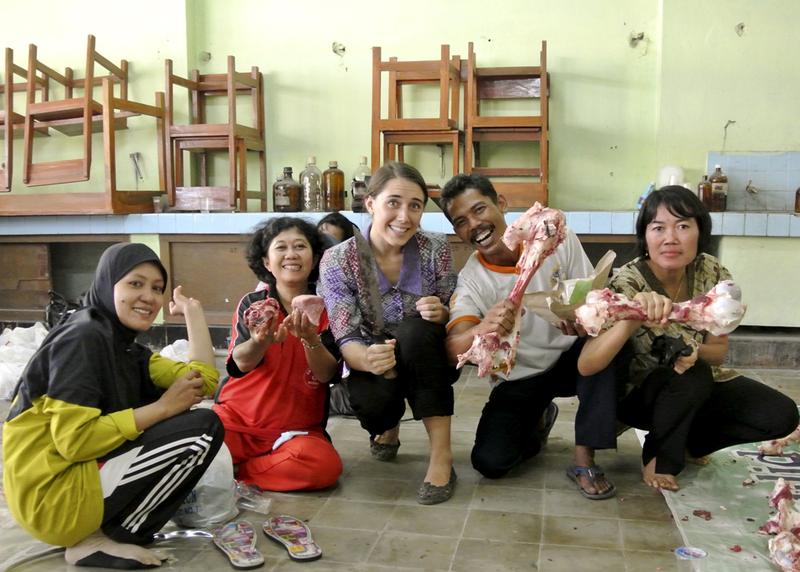 Despite the resemblance to a makeshift meat-processing plant, the atmosphere in the classroom was that of a party: teachers joked with the students, posed together for photos wielding enormous leg bones, and ate nasi jotos(being careful not to touch the rice with their bloodied hands) as male students darted back and forth distributing the fresh meat. Clearly uncomfortable wielding a machete, I was given the inglorious task of holding the meat as my partner cut at the “hacking station.” It was quickly evident why cutting the meat was a two-person job: freshly slaughtered beef is not easy to slice. The meat wants to hold together like the muscle it recently was, and you must saw the knife through the strands rather than slice. My job was to hold the meat taut, which was difficult because it was so warm and slippery in my hands. My partner soon despaired of my meat-holding skills, and I was reassigned as a runner between the “hacking station” and the “weighing station.” I juggled the slippery cow parts in my hands, occasionally slipping in puddles of crimson blood, and deposited my strange treasure in piles next to the scales. My fellow teachers laughed at me good-naturedly as I dropped a handful on the floor and grimaced at the splatter on my slacks. By the end of the first cow, my hands were covered with the gluey fat which took ten minutes to scrub off of my palms. Everyone took an istirahat (break) and I sought fresh air outside of the blood-spattered classroom. Preoccupied with my non-vomiting success, I inadvertently walked right up to the beginning of the second cow slaughter. Students eager to watch pressed up behind me and I was trapped in a front-row seat. This was the part I wasn’t sure I could stomach, and I looked away as the specialists tripped the cow and dragged it to the bleeding station. I still heard the mournful moan of the doomed cow as my favorite teacher cut its throat, as it is Muslim tradition to do. But I also heard the prayers of the men surrounding the cow, trying to sooth the animal in its final twitches. In these moments I found difficult to watch, I wasn’t struck by the barbarity of death but rather by the pervasive thankfulness in the air. The men prayed in earnest and my mind turned back to the many white bags in the classroom, prepared for distribution to the poor. I had always seen animal sacrifice as an unnecessary waste, an archaic and inhumane tradition. But this sacrifice was not set out for an unseen God to come and devour – rather, it was intended to be used (and, in Indonesia, every part would be used). The sacrifice wasn’t just to honor God, but also to honor the least of these and give thanks for our own good fortune. 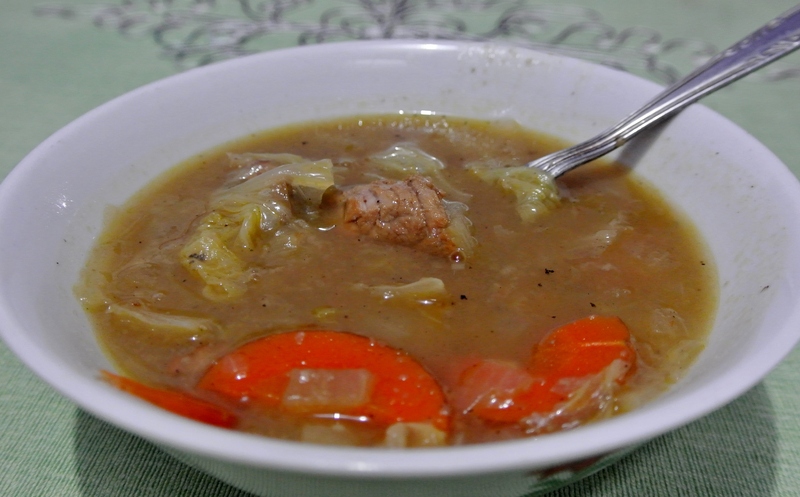 Madiun’s poor population subsists on tempeh and tofu, which are inexpensive, yet inadequate, sources of protein. Meat, especially cow meat, is too expensive for many of the poor — but on this one holy day they could cook a large feast with the donated meat. The community was profoundly thankful and celebratory for the cow’s sacrifice. I smiled at this thought and returned to my gory duties with a new enthusiasm. That is, until a teacher asked me, “Miss Kelsey, you cook? What part do you want: the heart? The brain? The stomach? Orang Jawa, we love stomach!” and my own stomach once again turned queasy.